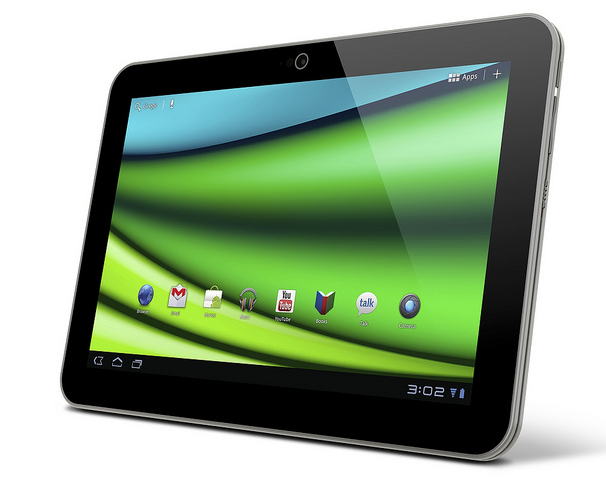 Toshiba’s super-slim 10-inch Excite, one of the hottest Android tablets this year, will debut in the U.S. on March 6. The tablet got the Best Tablet title at CES from PCWorld in January, and the name has slightly changed since then, from Excite X10 to Excite 10 LE. The Wi-Fi-only Excite 10 LE will cost $530 for the 16GB model and $600 for the 32GB model. This is slightly more than an equivalent iPad 2 (and probably iPad 3 come March 7), so why choose the Excite 10 LE over Apple’s tablet? Well, instead of competing on price, Toshiba is trying to place the Excite as a super-slim luxury tablet. Toshiba claims its device is the world’s thinnest and lightest 10-inch tablet, measuring 0.3 inches (7.7 mm) thick and weighing 1.18 pounds (535 g). For comparison, the iPad 2 is 0.34 inches (8.8 mm) thick and weighs 1.33 pounds (601 g). Toshiba also used premium materials for the Excite 10 LE, including magnesium alloy surface and scratch-resistant Gorilla Glass display. The screen is 10.1 inches, has a 1280 x 800 resolution and a 16:10 aspect ratio. In PCWorld’s hands-on at CES with the tablet, the display looked good, with a minimal air-gap and a wide viewing angle; but text and graphics weren't as sharp as on the Acer Iconia Tab A700, which has higher resolution. The processor inside is a dual-core 1.2 GHz Texas Instruments OMAP 4430 with 1GB of RAM, which makes the Excite the first tablet from Toshiba with an OMAP processor. There are also dual cameras on board: a 5-megapixel on the back, capable of 1080p HD video recording and with a LED flash, and a 2-megapixel front-facing camera for video chat. For its thinness, the Excite LE has plenty of ports neatly aligned along the edge: the headphone jack, micro-USB, micro-HDMI, and microSDHC. The tablet has the usual connectivity options (Bluetooth and Wi-Fi), but lacks 3G or 4G cellular connectivity. Toshiba is missing a trick with the Excite 10 LE tablet though, which comes with stock Android 3.2 Honeycomb initially, and not with Android 4.0. The company said the tablet would be upgradeable to Ice Cream Sandwich later in the year.